Because they died in war. Their bravery and their graves you mock. t'is your turn now. Give for their sake. 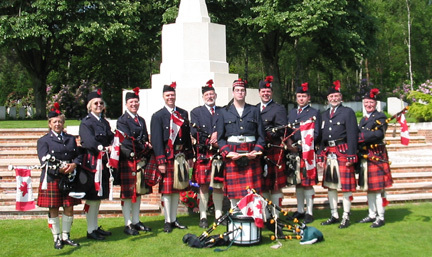 As Chairman of the Foundation Welcome Again Veterans I heartily welcome you to the Canadian War Cemetery in Holten on the occasion of your visit to this area before you are participating in the the ceremony on June 6th on Juno Beach in Normandy. Some of the toughest battles experienced by the Canadian Army, as it fought his way across Europe during World War II took place in the Netherlands. It was here in May 1945 that the war ended for the Canadians, who stayed on as guests and helpers during post-wartime. They became friends of the Dutch people, who were and still are thankful to the Canadians for their efforts in the liberation of this country making an end of 5 years of occupation and terror. The ties forged in war between Canada and the Netherlands have remained equally strong during the almost 60 years of peace. Now you are here, visiting one of the Canadian War Cemeteries in the Netherlands. You can see now by your own eyes what war causes. Here are buried those brave men who did not make it home. They gave their life for our and your freedom too. Young men in the prime of their life, with an own name and own face. We don´t know these soldiers, nor do we know their faces. Nevertheless we feel a strong bond with them. Although they are buried in a foreign country, their last resting place is among friends. It has therefore became a part of the curriculum of the youth of Holten to lay down flowers on the graves every year on May 4th, the Dutch National Commemoration Day, and put burning candles on each of the 1,394 graves on Christmas Eve. War, danger of war, hate and discrimination are still not far from us today. The purpose of life can and must be to live together in peace, freedom and toleration. If you want to have the right to live in that way, you have the duty to give it to others too. Its the task of us all to do all efforts to keep peace, so that those young men who are buried here didn´t die in vain.